Okay, so I can be shallow. I requested this one because of the pretty cover and the intriguing blurb. That said, there's nothing shallow about Dark Horse. The thing I love most about this book is everyone, and I mean everyone, has an angle. Some wear it on their sleeve and others surprise you, sometimes not for a good long while. With several races and political agendas, nobody fits neatly into their role. So many times I found myself muttering no, no, no as something amazing I didn't want to see twisted the plot and ramped up the story. My favourite character is Sazo, the AI. There's something so chilling and unpredictable about him. He's also inquisitive, immature and very,very likeable. Rose and Dav are great together. This isn't a Mars Needs Moms trope novel at all. No contrived setup puts them together. 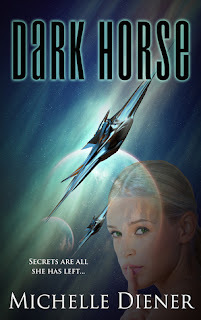 Dark Horse is action packed and full of surprises and backed up by a comfortable and well-built world.